I love the yellow and purple… and all the chrome, don’t you?? 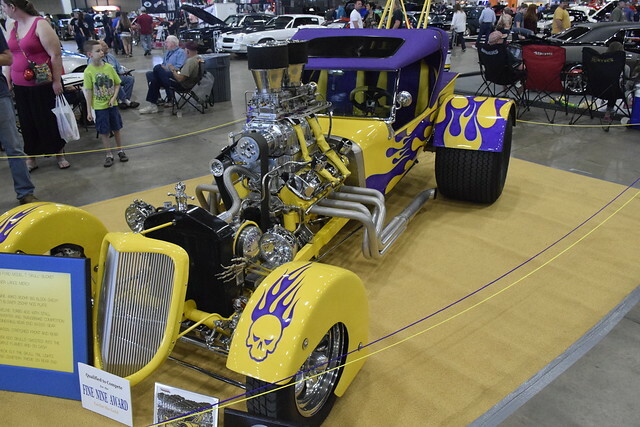 This latest weekend was the latest installment of the Starbird Car Show here in Tulsa. The event is just mind boggling. 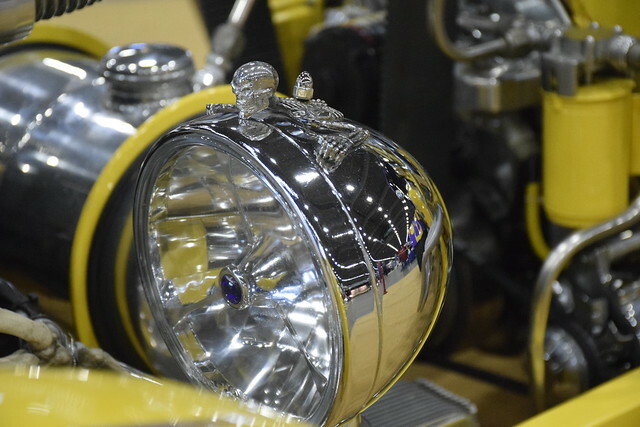 There are hundreds of cars on display and they are almost all one of a kind in one or another and the display of creativity, craftsmanship, hard work and pride that the owners put into their machines is just amazing. I took hundreds of photos but don’t worry, I’ll spare you. The guys that build the machines are car guys. I am not a car guy but I know several. I hardly ever pop the hood on my own car let alone do anything to the car. My Dad taught me how to do all the now obsolete skills. Change the points, adjust the timing, gap the spark plugs, all that stuff. All that has gone by the wayside now. But there are still lots of people who modify engines, change transmissions, put in new rear differentials. 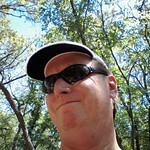 Others who do their own body work and have learned wire welding and how to paint. I salute them. So, is that a legal turn signal. Have you ever had a skull wink at you? 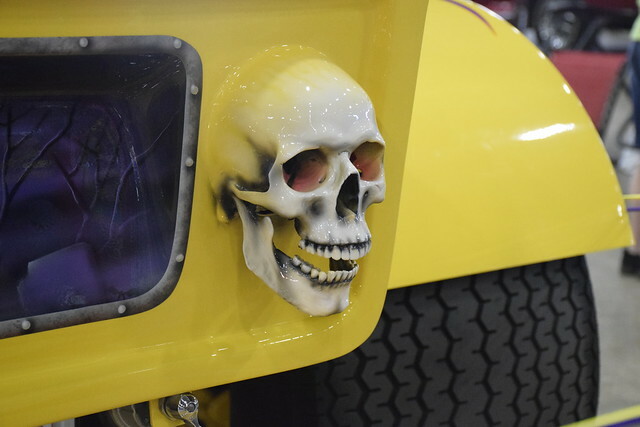 The cars at this show are done by the professionals and dedicated amateurs who have poured hundreds of hours into these creations. 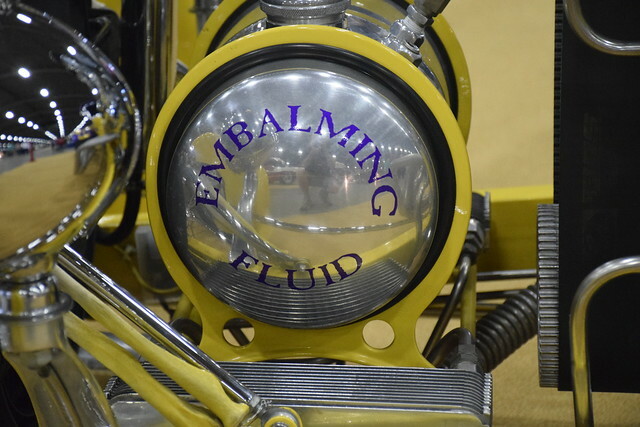 The small little death’s head on top of the headlight. Does your car have that feature? I hardly ever miss the regular Tulsa Car show held in the Spring of the year. The cars are great but are not very distinctive. All the sedans look like Toyota Camry’s in my opinion. Nothing wrong with that mind you but I like looking at bright colors and outrageous designs. Well, I don’t think it gets good mileage and the tank is rather small. I think it will get you a quarter mile which is long enough. Anyways, you may wonder why I take hundreds of pictures of great and unique cars and yet show only pics of one car. Hey if you figure it out let me know and then we will both now. I am just simply overwhelmed so I decided to just start with one of my favorites. I’ll be doing other posts on this cars and dribbling out on Instagram as time goes by. So, have you seen a car you like lately? 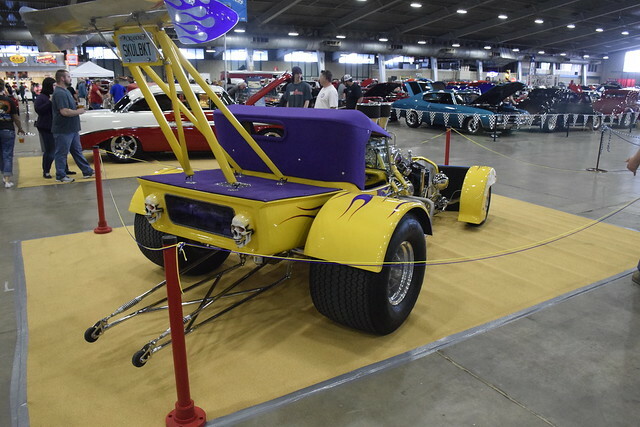 This entry was posted in Car Shows and tagged Cars, Custom Car, Drag Racer, Oklahoma, Purple, Starbird Car Shows, Tulsa, Yellow on February 21, 2016 by Alan Bates.